Seagate is boosting the maximum size of its everyday hard drives with an 8TB HDD optimized for NAS boxes. While larger consumer hard drives exist already, they tend to be for archival purposes only. Seagate’s latest drive is designed to fit in a network-attached storage bay. NAS boxes can be used by consumers to store large quantities of videos, photos, and music on a local network, and are also ideal for creative professionals dealing with large media files. Desktop PCs could also make use of these drives in a RAID setup. 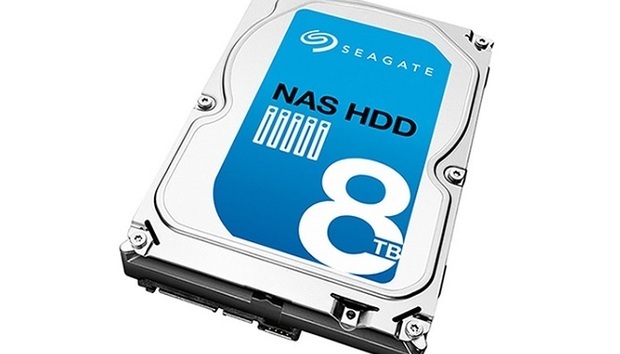 Seagate first announced its NAS-optimized HDD line in 2013, promising to dampen vibration, consume less energy, and operate more quietly than conventional drives. However, the 8TB version demands nearly twice as much power as Seagate’s 4TB version, at 7.2W idle and 9W operating. On the bright side, the new drive supports a 216MB per second max sustainable transfer rate and 256MB cache, both major improvements over Seagate’s smaller drives. Like other Seagate NAS drives, the 8TB HDD supports NAS boxes with up to eight drive bays, so users could have 64TB of storage available at home if they wanted. NASWorks error correction technology is also included, and the drive comes with a three-year warranty. Seagate’s 8 TB HDD will have a $385 suggested price tag according to Anandtech, and will ship later this quarter. The company already sells 6TB and 4TB versions for $300 and $230, respectively, though it’s possible to find them on sale through retailers such as Amazon and Newegg. Why this matters: The average user probably won’t have much need for an 8TB NAS drive, especially when you can throw a pair of 4 TB drives into separate bays for much cheaper. But as with any new storage milestone, this will likely bring down the price of NAS-optimized storage a whole, making the prospect of setting up a local media and file server much more tempting. The Race for the Cloud Productivity Suite: The Hare or the Tortoise?